By Lisa Cornish. 03 October 2018. The Pacific Islands Forum Leaders Meeting, held in Nauru Sept. 3-6, was meant to produce concrete plans for supporting Pacific Island nations in their battle against climate change. Instead, reports suggest it was a stalemate for climate action. The Australian government in particular was said to be responsible for preventing a statement outlining a strong position and action on climate change. “The Australian government is falling far short of its responsibility to meet global targets to reduce carbon emissions, and to provide a fair share of climate finance to ensure that low-income countries most vulnerable to the impacts of climate change have the resources to adapt and build resilience,” Executive Director for ActionAid Australia Michelle Higelin told Devex. Those feeling the greatest impact of the lack of political action are Pacific Island communities, particularly women, who are changing their lives to respond to the impact of climate change and secure their children’s’ future. On the island of Tanna in Vanuatu, 180 women gathered early last month to discuss climate change and disaster response — despite the lack of political action from neighboring countries. The Women I Tok Tok Tugeta forums, an ActionAid Australia program supported by the Department of Foreign Affairs and Trade through the Australian NGO Cooperation Program, provided a platform to ensure the concerns of women on climate and disaster resilience are voiced and addressed. The group is also building the political strength of women to engage with political systems and influence climate response directly — including standing for election to drive change. In a country where the number of elected women totals zero, this is no easy task. For these women, there is little confidence that the world will listen to them until they are in a position of authority. Vanuatu is one of the most disaster-prone countries in the world, making the small island of Tanna — located south of Port Vila — one of the most dangerous places to live for climate-related disasters. The island, which is 40 kilometers (25 miles) long and almost 19 kms wide, is still recovering from the impact of Tropical Cyclone Pam in 2015 — one of the worst tropical storms ever to hit the region. Climate-related disasters have become something these women expect, which means their futures are uncertain, including the lives and opportunities for their children. For the women of Tanna, the idea that some governments still question the reality of climate change is more than a frustration. “The women we work with are aware that climate change is affecting them,” said Carol Angir, manager of ActionAid’s work in Vanuatu. “They know this from the weather change and the recurrent cyclones affecting their communities. Dorosday Kenneth Watson, from the Vanuatu Department of Women’s Affairs, sees women’s leadership as important in creating political change. “There is important work being done to build up the rights and position of women all over Vanuatu, especially in relation to climate change. This ensures decision-makers are accountable to the needs, perspectives, and priorities of communities and women,” she said. The September meeting heard from women who had traveled to Nepal and Indonesia to connect with and learn from other women responding to climate-related challenges internationally. They spoke of the desire to challenge gender stereotypes about women’s capacity for leadership within Vanuatu. As part of an upcoming provincial government by-election, a number of Tanna women nominated themselves. One was accepted. It is a small step, but one to celebrate. “We are asking governments to ensure that the experiences, perspectives, and leadership of women in countries like ours are equally respected in decision-making on climate change,” said Mary Jack, provincial coordinator for ActionAid Vanuatu. to discuss how they would continue their political push one woman held a sign that read: “Join us in unleashing the power of women”. For the women of Tanna, their sole political representative is the start of a greater political push, encouraging more women to get involved in politics and create a stronger global climate response. 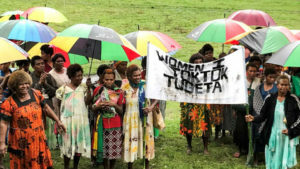 This story was developed with the support of ActionAid Australia who collected commentary from the September Women I Tok Tok Tugeta forum meeting on Tanna.